Peel back and snap off petals until a yellow cone remains; cut off pale green tips. Cut in half and put in cold water with vinegar or lemon juice to prevent browning. Drain and cook in boiling water with salt and garlic to taste. Do not overcook baby artichokes. In a large skillet, heat olive oil. Sauté onions until clear; add garlic and stir. Add ground beef, salt, cumin, and pepper; cook meat until brown. Add the rest of the ingredients and baby artichokes; mix together and stir until mixture boils. Gradually stir in the El Pato sauce. Add salt and pepper to taste, simmer for approximately 7-10 minutes. 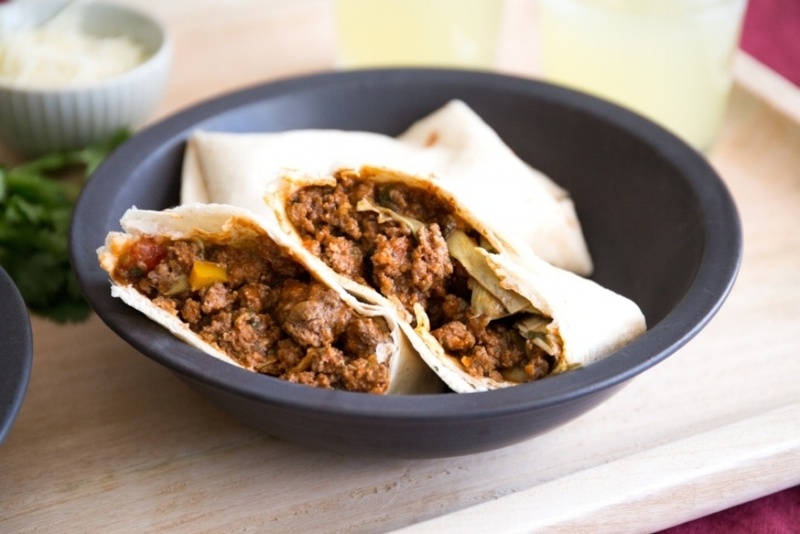 Warm flour tortillas, roll up burritos and add Monterrey jack and/or cheddar cheese if desired. ENJOY!